You'll see how a quiet Irish Catholic neighborhood suddenly added "World's Gay Mecca" to its list of attractions, how opposites learned to live in harmony. Whether you use this knowledge to bring about world peace is entirely up to you. 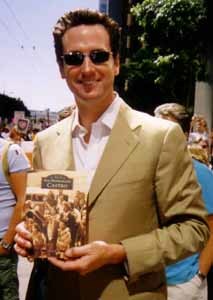 San Francisco Mayor Gavin Newsom moves my camera strap from in front of my lens and then poses with San Francisco's Castro, 6/27/04. "San Francisco's Castro is a loving black-and-white photo collection charting the 150-year history of the neighborhood ... Strange skillfully weaves commentary and history with whimsy and wit." From Dave Ford's witty 3-page San Francisco Chronicle review and interview 1/23/04 Click to read entire story with five photos on sfgate.com. 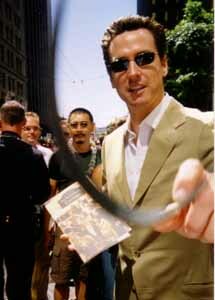 "Strange is the wittiest, most over-the-top character this side of Quentin Crisp. But his new book, Images of America: San Francisco's Castro, is a very serious, vital and informative pictorial history of America's gay Mecca, from 1870 until the present. ... It's a treasure chest. ... It's a breathtaking achievement." "San Francisco's Castro has been flying off the shelves." WHAT YOU'LL SEE IN "SAN FRANCISCO'S CASTRO"
You'll see the 1902 Most Holy Redeemer Catholic Church, the 1906 earthquake, the 1917 dedication of the Twin Peaks Tunnel, the 1922 opening of the Castro Theatre and the 1936 first version of Cliff’s Variety. You'll see Castro Street Fairs, Gay Pride Parades, the Sisters of Perpetual Indulgence, the Café Flore, Sylvester, Lily Tomlin, Divine and Ginger Rogers, then the AIDS epidemic and the NAMES Project’s AIDS Quilt. You'll see Harvey Milk Plaza, Harvey Milk Civil Rights Academy, etc. Harvey Milk was a closeted gay Republican working on Wall St. Then he met Tom O’Horgan, director of Hair, became a hippie and moved to San Francisco, opening Castro Camera with his lover Scott Smith in 1973. You'll watch Harvey Milk run for public office four times, until he becomes the first openly gay man to hold a major elected public office in the United States. You'll meet Allan Baird, the Teamster official in charge of the Coors boycott, who became Harvey Milk’s close friend and ally, leading to Harvey’s becoming the first openly gay candidate to be endorsed by the Teamsters, firefighters and constructions workers unions. 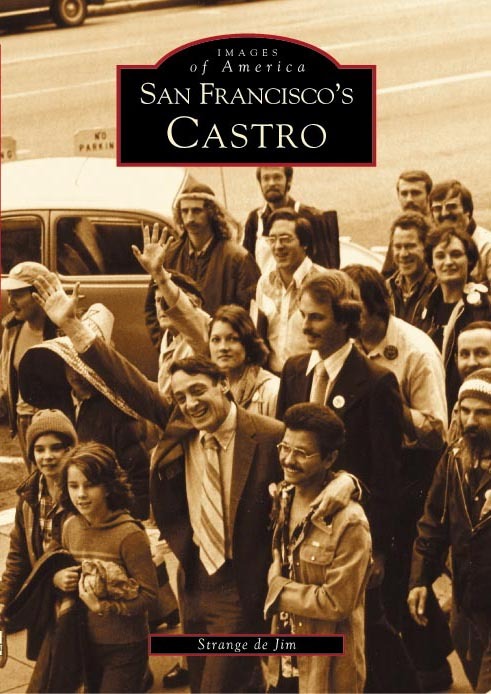 On the cover (above) you see Harvey Milk marching from Castro Camera to City Hall to be sworn in as San Francisco Supervisor. You'll see the spontaneous 40,000-person candlelight march from the Castro to City Hall when Harvey Milk and Mayor George Moscone were assassinated by former Supervisor Dan White. You'll see Harvey’s ashes and four of his lovers, the “Milk widows,” sailing under the Golden Gate Bridge to scatter his ashes at sea. You'll see the riots and burning police cars a year later when Dan White was found guilty only of manslaughter. You'll see how Most Holy Redeemer Church became, at 80% gay, the gayest Catholic church in the world, outside the Vatican. 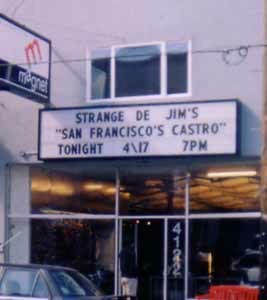 San Francisco Examiner, Bruce Bellingham, 11/25/03: Now that we’re in the Castro his curious self, Strange de Jim, dropped by The Examiner yesterday with a copy of his fascinating new book, San Francisco’s Castro, which is part of the well-known “Images of America” series, published by Arcadia. It’s a 128-page photo history with commentary about the neighborhood from the 1880s to the present. Click on the icon below to see San Francisco's Castro on Amazon.com. The Strange Experience has photos of a hundred friends happy to tell the public I gave them a blindfolded mystery massage.